The CT520 wireless traffic generator is an excellent choice for testing Access Points and other WiFi networks. The CT520 uses a modified Wireless driver for WiFi NICs based on the Atheros chipset. It can support up to 32 Virtual Stations. Each of the Virtual Stations has its own IP address, IP port space, MAC address and routing table. The Virtual Stations can be assigned to communicate to a particular Access Point, use a particular SSID, and have optional WPA2 key assigned. More advanced 802.1X authentication is also included. There is a single WiFi radio per CT520 but multiple LANforge systems can be clustered together for more realistic radio interference patterns and increased traffic generation capability. The radio supports 802.11 a, b, g or n mode. Transmit power and channel/frequency is configured on a per-radio basis. Most other settings are configurable per virtual station. Simulate up to 128 802.11a/b/g/n Wireless Stations in one small system. Each Virtual Station has its own IP address, IP port space, MAC address and routing table. Excellent for testing Access Points and other WiFi networks. The CT521a-264-1ac-1n wireless traffic generator is an excellent choice for testing Access Points and other WiFi networks. The CT521a-264-1ac-1n uses a modified Wireless driver for WiFi NICs based on the Qualcomm/Atheros chipset. The ath9k (a/b/g/n) chipset NICs can support up to 200 stations per radio. The ath10k (a/b/g/n/ac) chipset NICs can support up to 64 stations per radio. Each of the Virtual Stations has its own IP address, IP port space, MAC address and routing table. The Virtual Stations can be assigned to communicate to a particular Access Point, use a particular SSID, and Open or WPA/WPA2 authentication assigned. More advanced 802.1X authentication is also included. Each radio can be configured independently of the other. Transmit power and channel/frequency is configured on a per-radio basis. Most other settings are configurable per virtual station. The CT522-264-1ac2-1n wireless traffic generator is an excellent choice for testing Access Points and other WiFi networks. The CT522-264-1ac2-1n uses a modified Wireless driver for WiFi NICs based on the Qualcomm/Atheros chipset. The ath9k (a/b/g/n) chipset NICs can support up to 200 stations per radio. The ath10k (a/b/g/n/ac) chipset NICs can support up to 64 stations per radio. Each of the Virtual Stations has its own IP address, IP port space, MAC address and routing table. The Virtual Stations can be assigned to communicate to a particular Access Point, use a particular SSID, and Open or WPA/WPA2 authentication assigned. More advanced 802.1X authentication is also included. Each radio can be configured independently of the other. Transmit power and channel/frequency is configured on a per-radio basis. Most other settings are configurable per virtual station. The CT523-600 wireless traffic generator is an excellent choice for testing Access Points and other WiFi networks. 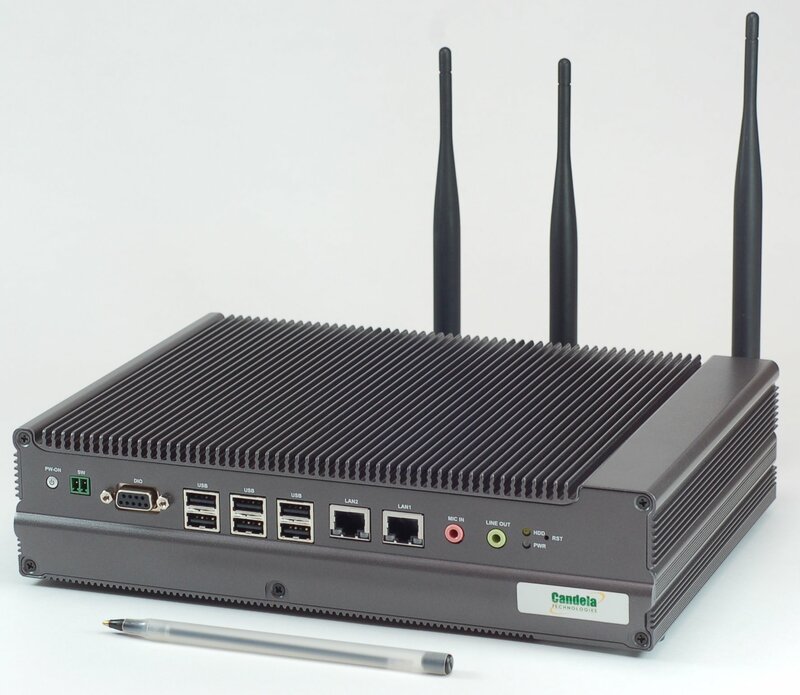 The CT523-600 uses a modified Wireless driver for WiFi NICs based on the Atheros chipset. It can support up to 600 Virtual Stations (Up to 200 per radio). Each of the Virtual Stations has its own IP address, IP port space, MAC address and routing table. The Virtual Stations can be assigned to communicate to a particular Access Point, use a particular SSID, and have a WEP (64 or 128bit) or WPA/WPA2 authentication assigned. More advanced 802.1X authentication is also included. There are three WiFi radios per CT523-600 and multiple LANforge systems may be clustered together for even more realistic radio interference patterns and traffic generation capability. Each radio can be configured independently of the other. Transmit power and channel/frequency is configured on a per-radio basis. Most other settings are configurable per virtual station. The CT523b-256-2ac2-2ac has two free slots to add additional /ac or /n radios. Existing STA licenses may be used or additional STA licenses may be purchased (please contact sales for licensing options). The CT523b-256-2ac2-2ac wireless traffic generator is an excellent choice for testing Access Points and other WiFi networks. The CT523b-256-2ac2-2ac uses a modified Wireless driver for WiFi NICs based on the Qualcomm/Atheros chipset. The ath10k (a/b/g/n/ac) chipset NICs can support up to 64 stations per radio. Each of the Virtual Stations has its own IP address, IP port space, MAC address and routing table. The Virtual Stations can be assigned to communicate to a particular Access Point, use a particular SSID, and Open or WPA/WPA2 authentication assigned. More advanced 802.1X authentication is also included. Each radio can be configured independently of the other. Transmit power and channel/frequency is configured on a per-radio basis. Most other settings are configurable per virtual station. The CT524-328-2ac2-1n-10g wireless traffic generator is an excellent choice for testing Access Points and other WiFi networks. The CT524-328-2ac2-1n-10g uses a modified Wireless driver for WiFi NICs based on the Qualcomm/Atheros chipset. The ath9k (a/b/g/n) chipset NICs can support up to 200 stations per radio. The ath10k (a/b/g/n/ac) chipset NICs can support up to 64 stations per radio. Each of the Virtual Stations has its own IP address, IP port space, MAC address and routing table. The Virtual Stations can be assigned to communicate to a particular Access Point, use a particular SSID, and Open or WPA/WPA2 authentication assigned. More advanced 802.1X authentication is also included. Each radio can be configured independently of the other. Transmit power and channel/frequency is configured on a per-radio basis. Most other settings are configurable per virtual station. The CT524-328-2ac-1n-1gf wireless traffic generator is an excellent choice for testing Access Points and other WiFi networks. The CT524-328-2ac-1n-1gf uses a modified Wireless driver for WiFi NICs based on the Qualcomm/Atheros chipset. The ath9k (a/b/g/n) chipset NICs can support up to 200 stations per radio. The ath10k (a/b/g/n/ac) chipset NICs can support up to 64 stations per radio. Each of the Virtual Stations has its own IP address, IP port space, MAC address and routing table. The Virtual Stations can be assigned to communicate to a particular Access Point, use a particular SSID, and Open or WPA/WPA2 authentication assigned. More advanced 802.1X authentication is also included. Each radio can be configured independently of the other. Transmit power and channel/frequency is configured on a per-radio basis. Most other settings are configurable per virtual station. The CT524-264-1ac-1n-ef wireless traffic generator is an excellent choice for testing Access Points and other WiFi networks. The CT524-264-1ac-1n-ef uses a modified Wireless driver for WiFi NICs based on the Qualcomm/Atheros chipset. The ath9k (a/b/g/n) chipset NICs can support up to 200 stations per radio. The ath10k (a/b/g/n/ac) chipset NICs can support up to 64 stations per radio. Each of the Virtual Stations has its own IP address, IP port space, MAC address and routing table. The Virtual Stations can be assigned to communicate to a particular Access Point, use a particular SSID, and Open or WPA/WPA2 authentication assigned. More advanced 802.1X authentication is also included. Each radio can be configured independently of the other. Transmit power and channel/frequency is configured on a per-radio basis. Most other settings are configurable per virtual station. The CT525-384-6ac wireless traffic generator is an excellent choice for testing Access Points and other WiFi networks. The CT525-384-6ac uses a modified Wireless driver for WiFi NICs based on the Qualcomm/Atheros chipset. The ath10k (a/b/g/n/ac) chipset NICs can support up to 64 stations per radio. Each of the Virtual Stations has its own IP address, IP port space, MAC address and routing table. The Virtual Stations can be assigned to communicate to a particular Access Point, use a particular SSID, and Open or WPA/WPA2 authentication assigned. More advanced 802.1X authentication is also included. Each radio can be configured independently of the other. Transmit power and channel/frequency is configured on a per-radio basis. Most other settings are configurable per virtual station. The CT525-792-3ac-3n wireless traffic generator is an excellent choice for testing Access Points and other WiFi networks. The CT525-792-3ac-3n uses a modified Wireless driver for WiFi NICs based on the Qualcomm/Atheros chipset. The ath9k (a/b/g/n) chipset NICs can support up to 200 stations per radio. The ath10k (a/b/g/n/ac) chipset NICs can support up to 64 stations per radio. Each of the Virtual Stations has its own IP address, IP port space, MAC address and routing table. The Virtual Stations can be assigned to communicate to a particular Access Point, use a particular SSID, and Open or WPA/WPA2 authentication assigned. More advanced 802.1X authentication is also included. Each radio can be configured independently of the other. Transmit power and channel/frequency is configured on a per-radio basis. Most other settings are configurable per virtual station.